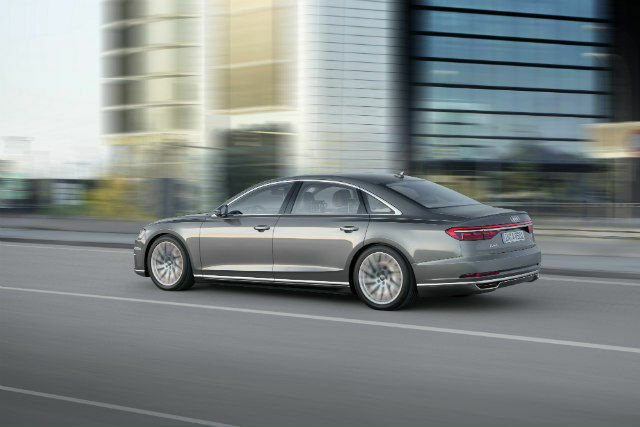 The all-new Audi A8 has a suite of 41 individual driver assist systems in it! All of that is alongside a new design, a hybrid drivetrain and a claimed status of "highly automated driving". Audi has made a significant leap with the all-new Audi A8 premium luxury saloon. 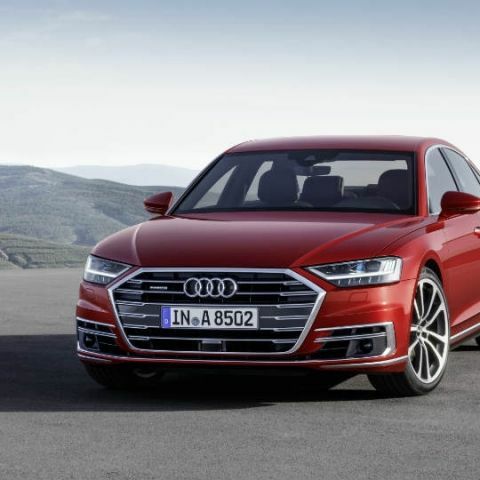 While the new Audi A8 brings with itself a host of styling and interior upgrades, the biggest headline here is the highly automated driving system, comprising of 41 individual driver assist systems. Alongside, it houses an all-new infotainment system with two touchscreen interfaces, an intelligent voice processor, self-learning navigation, and other elements like a dynamic steering wheel and active suspension adjustment. The artificial intelligence-powered traffic jam pilot system in the Audi A8 incorporates radar, ultrasonic sensors, a laser sensor and surround cameras to compute an image of the surroundings and gauge proximity. It uses this data to automate starting/stopping, braking, acceleration and steering in traffic conditions at speeds of up to 60kmph. The mode can be activated by pressing the AI button mounted on the central console, which activates the on-board computers to take charge of the car. The central driver assistance controller (zFAS) takes in the computed image of the surroundings, uses deep learning to recognise road signs, proximities, barriers and approaching speeds of nearby objects to decide the course of the car. The traffic jam pilot system will be able to drive the car at speeds of up to 60kmph, and once emptier roads are reached or maneuvering becomes more difficult, the car will alert the driver to take control of the car. The technology will be implemented depending on nation-wise laws and regulations. Based on that, drivers can take their eyes off the road and do another activity, like checking on emails or watching videos on the onboard display. In addition, the sensors will be able to make self-parking truly autonomous by implementing remote control. This will require no human intervention while parking the car at an intermediate spot, or even in garages. Owners can use the remote parking technology to summon the car automatically from parking spot. The control interface is guided through the myAudi app, where the users will see a live feed of the car's 360-degree cameras and the location. To add symmetry with the new technology, Audi is doing away with most physical buttons and incorporating everything into touchscreen display panels. The main display is 10.1 inches, and houses the common entertainment, information and navigation functions. A secondary touch display houses climate control and comfort functions (seat adjustments, massage functions, etc. ), and all of the interactions are held through these two displays. 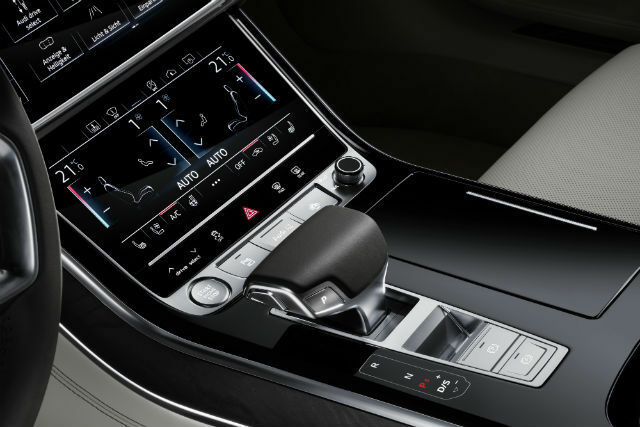 Alongside the standard features, the new Audi A8 includes gesture control to enable features, and an advanced speech interface to take charge of voice controls. Audi states, "the A8 can also engage in intelligent conversation. The driver can activate an array of functions in the automobile using a new, natural form of voice control. Information on destinations and media is either available on board or is delivered from the cloud at LTE speed. The extensive Audi connect range also includes traffic sign recognition and hazard information – innovative car-to-X services that draw on the swarm intelligence of the Audi fleet." Along with this is a smarter navigation system that has machine learning algorithms to learn frequented routes, usual traffic data and relies on the Internet connectivity to exchange information from the cloud servers with onboard LTE connectivity. The seamless interface of the infotainment system includes faint touch buttons that Audi claims will respond with faint touches. Other features in the A8's rear seat include HD matrix reading lights, feet sole massagers and ventilators, and have rear remotes with OLED displays to control the car functions. The new Audi A8 has dynamic all-wheel steering, which adapts itself to driving styles and conditions to adjust feedback and handling in order to maximise vehicle stability. The car gets active steering ratio distribution and active torque distribution to enhance the handling of the long wheelbase saloon, and combines this with an active suspension. The suspension is coordinated with zFAS to get data about the road, and if there are lateral irregularities on road, the suspension automatically adjusts the ground clearance and suspension stiffness to avoid collision. This can be particularly pivotal in roads like India's, where road irregularities are frequent. Two engine options are being introduced with the Audi A8 right now - a 3-litre TDI V6 and a 3-litre TFSI V6. The diesel and petrol variants respectively deliver 286bhp and 340bhp respectively, and two more eight-cylinder engines will follow soon. These engines will be a 4.0 TDI that delivers 435bhp and a 4.0 TFSI that delivers 460bhp. A further, top-of-the-line W12 variant of the Audi A8 will be launched later. 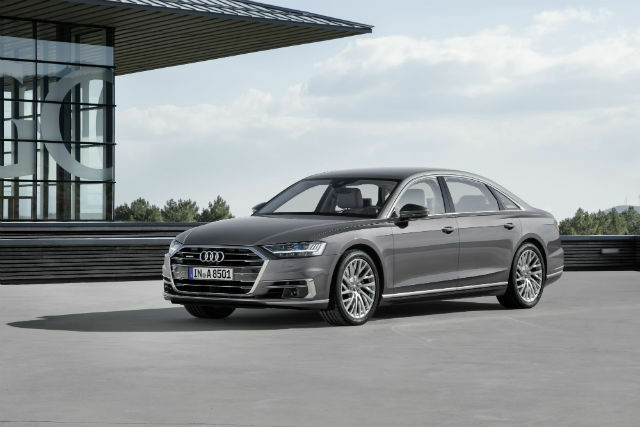 Audi has implemented 48V mild hybrid architecture on the Audi A8 to improve fuel efficiency alongside increasing range, and gives the A8 nearly 50 kilometres of all-electric driving range. Thinking of buying a new HTC One E 8. Is it a better phone ?